A man with high DHT-sensitivity started losing hair at 19, but didn’t have any medical treatment until 25, including minoxidil and finasteride. By 25, thinning at the mid scalp, hairline, and crown were already quite advanced. 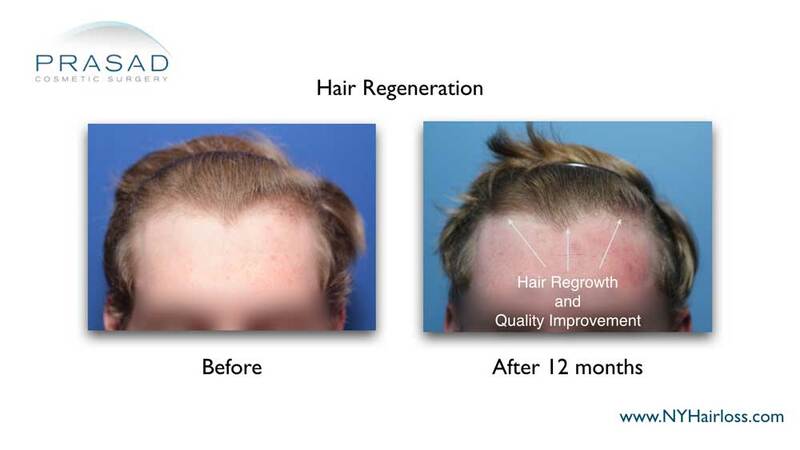 He had one Hair Regeneration injection treatment session at age 25. Male pattern hair loss patients at this age are usually prescribed finasteride as part of the treatment plan, and a prescription was written. However, like many patients, compliance with finasteride can be difficult, even if it’s a signed part of the treatment plan. Male patients with high DHT-sensitivity are told that the Hair Regeneration treatment is not a finasteride alternative, and in most cases of men in their 20s, the treatment works best with finasteride as part of the treatment plan. 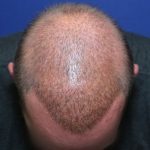 14 months after a single Hair Regeneration treatment, then already aged 26, hair atop his scalp was significantly thicker, and the horseshoe pattern of his hair loss grew smaller. Although hair transplants are not recommended for male patients under 30 due rapid hair loss progression that’s faster than hair can be transplanted, a hair transplant could not achieve the same density as native hair has a tighter density than is possible by even multiple transplants. A hair transplant with this much thinning native hair at the scalp would have resulted in collateral loss, where tightly spaced native hair follicles can be permanently damaged and lost by the sharp implanter tool. 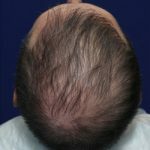 Thinning hair at the frontal hairline, mid scalp, and crown are significantly thicker after one Hair Regeneration treatment, and the patient chose to not take finasteride despite the issued prescription and inclusion in treatment plan. Finasteride is still recommended as a DHT-blocker for highly DHT-sensitive patients, most of whom are males in their 20s and early to mid 30s. While the results of this patient were achieved without finasteride, it was still prescribed for him at time of initial consultation. The Hair Regeneration treatment can thicken thinning hair, and stimulate growth from dormant hair follicles, but since it does not block DHT-formation, it is not a replacement for a DHT-blocker like finasteride. 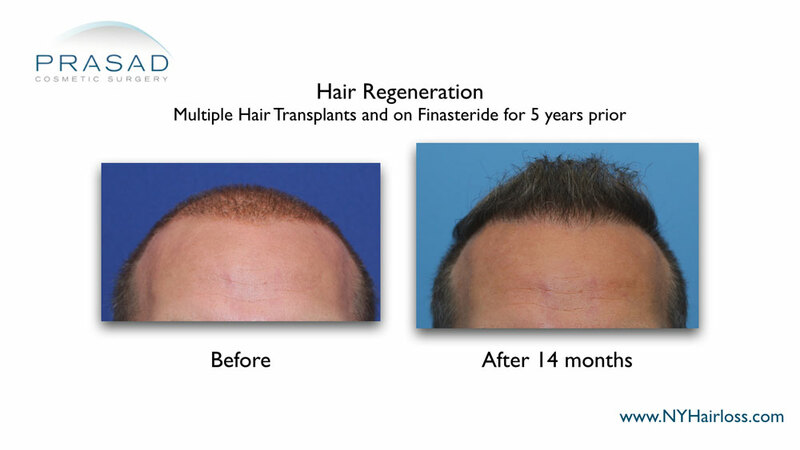 A combination treatment plan of Hair Regeneration with finasteride is best for men with high DHT-sensitivity, and early onset of pattern hair loss to get maximum hair coverage, and longer lasting results of the Hair Regeneration treatment. A 47-year-old man said his hair loss progressed over many years, but progression was slow, and was not aggressive. He didn’t use finasteride, or have any hair loss treatments prior to consultation. 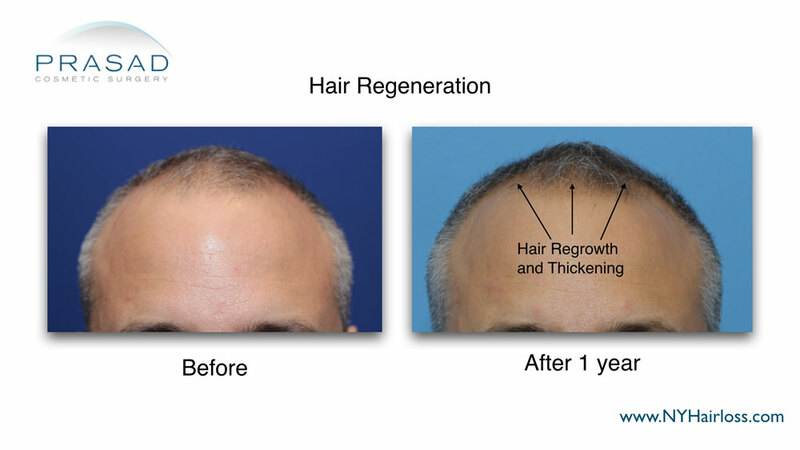 Hair thickness and growth at the frontal hairline increased with the Hair Regeneration treatment alone, and without any drugs before or after treatment. Hair density at the crown increased, as can be seen by the smaller amount of visible scalp at the center. Darker hair after the Hair Regeneration treatment is a common side effect of the procedure. 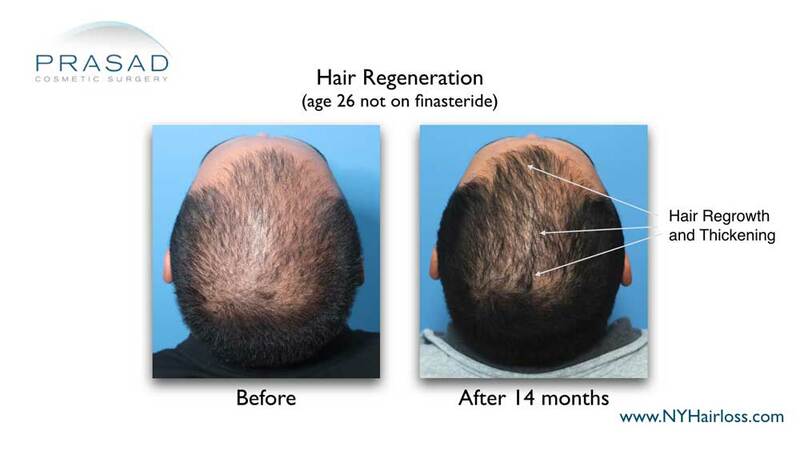 Only one Hair Regeneration injection treatment session was done, and with slow and late hair loss progression, DHT-sensitivity was determined as moderate, so a prescription for finasteride was not necessary. He was photographed before treatment, and again at one year after treatment. Darkened hair, especially among patients with graying hair prior to the procedure, is a common side effect of Hair Regeneration. The hairline is significantly denser and thicker after the Hair Regeneration treatment alone. Darker hair is a side effect of treatment, which is often seen in patients with gray hair prior to treatment. 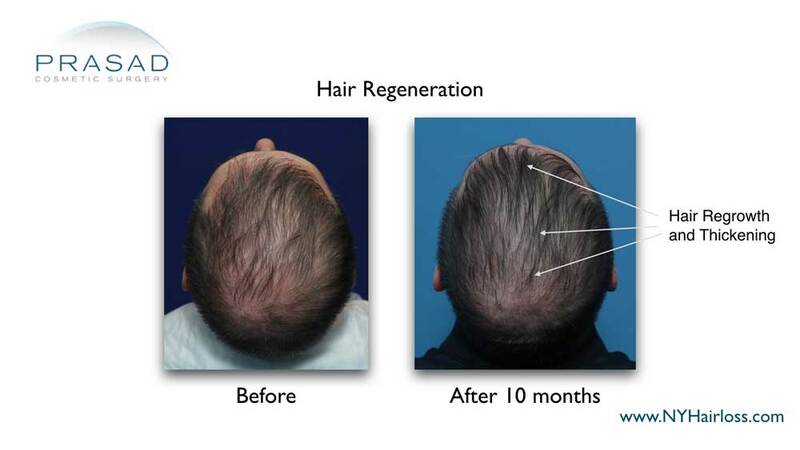 The Hair Regeneration treatment is not a finasteride alternative, especially for men who have high DHT-sensitivity shown in early and aggressive pattern hair loss. However, for men with slower progression and later onset of pattern hair loss, DHT-sensitivity is not as severe, so not requiring finasteride as part of the ongoing treatment plan can be considered. This man 3 follicular unit transplants (FUTs), otherwise known as the strip method, as well as 2 follicular unit extraction transplants (FUEs) long before his first consultation with us at age 39. He has very high DHT-sensitivity as his age of onset of hair loss was early at age 17, yet he didn’t start with a DHT-blocker until age 34. With a very rapid rate of progressive thinning and loss, he tried a short hairstyle to attempt to blend his thinning native hair, with the thicker grafted hair from his multiple hair transplants. 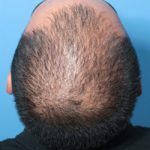 Thickened thinning hair from the Hair Regeneration treatment enabled this 40-year-old man to adopt a longer hairstyle. His previously thinning native hair, along with thicker transplanted hair didn’t look natural, so he kept a short hairstyle to try to camouflage his contrasting hair thickness. He had a single Hair Regeneration treatment session at age 39. 14 months after treatment, then age 40, the thicker and stronger hair gained with treatment allowed him to wear a longer hairstyle, without varying hair thickness to make it look odd. He was overjoyed to say that his hair hasn’t felt this healthy in 20 years. Thicker native hair at the frontal hairline after the Hair Regeneration treatment enabled better blending with thicker transplanted hair, so hair was more dense, and looked more natural. 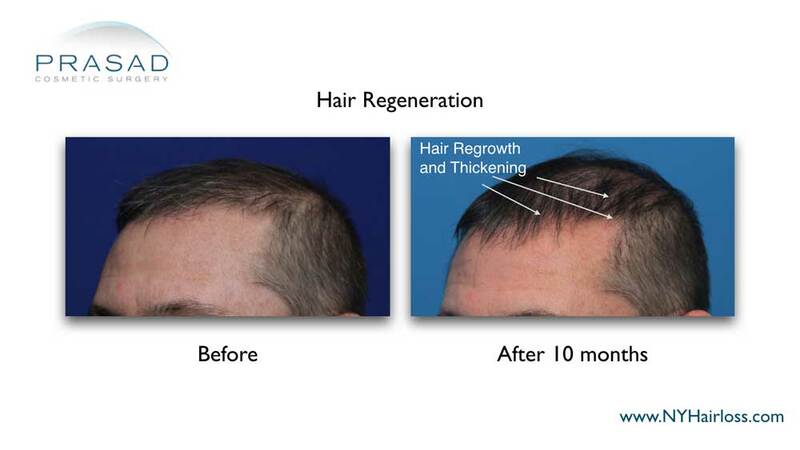 This particular case demonstrates how native and transplanted hair density and thickness can still be improved, even years after previous hair transplants, and in cases of early and aggressive pattern hair loss. 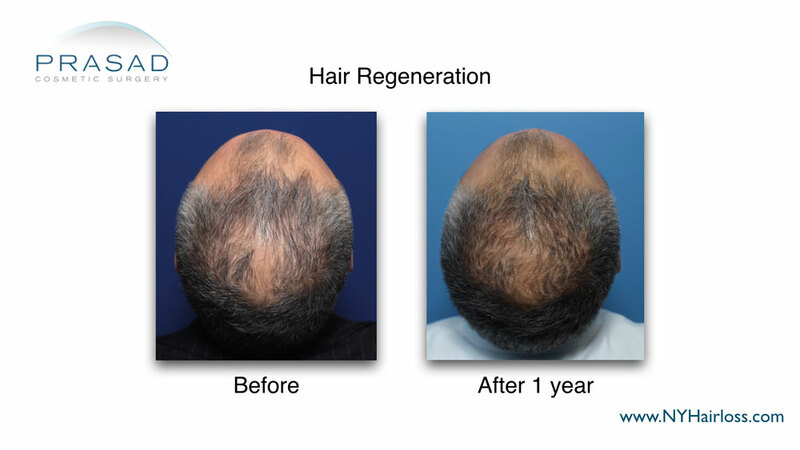 Multiple hair transplants with grafts placed far apart, and the continued thinning of native hair left this man with sparse hair density. With Hair Regeneration able to thicken grafted and thinning native hair to make overall density more even, he was able to grow his hair out to a longer style, and make his scalp look more natural. 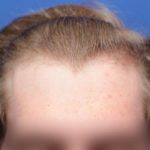 This 23-year-old man noticed his thinning hair at his hairline and temples for about two years, but didn’t use established hair loss treatments like finasteride or minoxidil for earlier treatment. 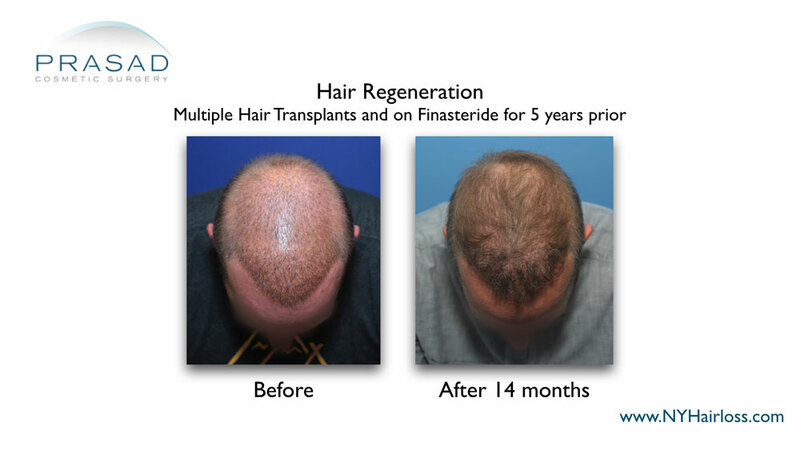 At the time of consultation, evaluation, and treatment, he had one Hair Regeneration treatment session, and started on finasteride for the first time. The frontal hairline had noticeably thicker and denser hair coverage, with also healthier hair texture after one Hair Regeneration treatment session. 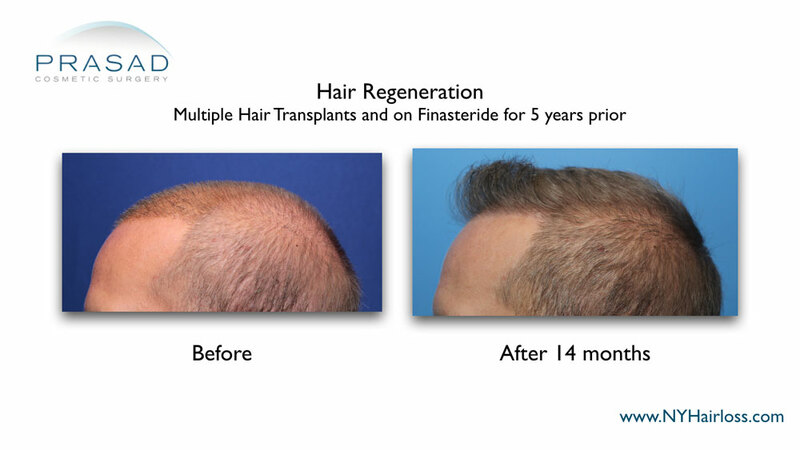 12 months after the Hair Regeneration treatment, and using finasteride for the first time, the frontal hairline grew thicker, and previously short and fine hairs at the temple grew longer and thicker. Fine hairs at the temple growing thicker and longer after a single Hair Regeneration treatment, along with first time finasteride use. This 32-year-old man had concerns about progressive hair thinning, which was becoming more visible even after previous scalp micropigmentation to camouflage his receding hairline. 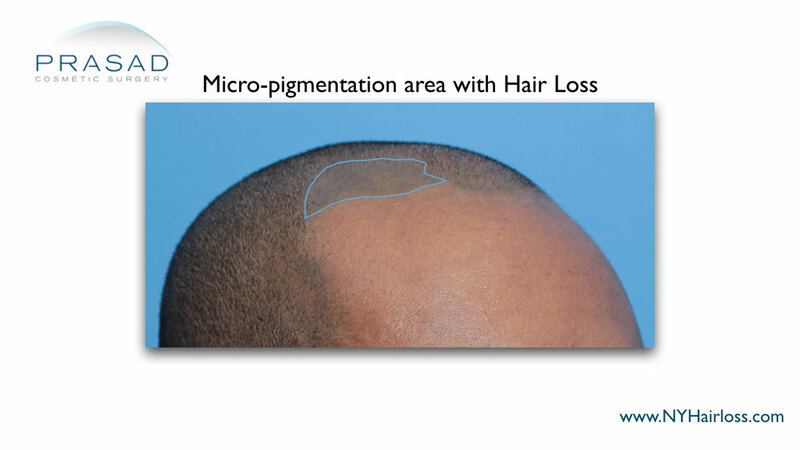 Scalp micropigmentation is a cosmetic tattoo procedure to simulate hair growth and hide the effects of hair loss. 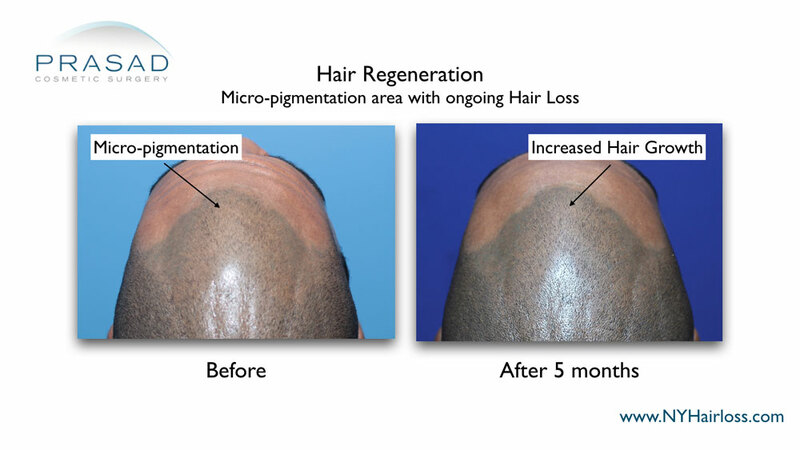 He wanted to gain some hair coverage to make micropigmentation appear more natural. 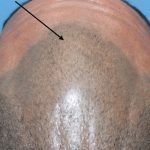 32-year-old man with virtually no natural hair coverage in this patch of his hairline, making his previous scalp micropigmentation look unnatural and obvious. A single treatment session of Hair Regeneration stimulated hair growth and thickened a previously thinning hairline, making scalp micropigmentation blend better with increased hair coverage, and look more natural. A 49-year-old man started losing hair about 10 years prior, which is classified as relatively late onset, so his scalp sensitivity to dihyrotestosterone (DHT) was moderate. His hair thinning was diffuse, or followed a pattern that covered the whole scalp. He wasn’t taking a DHT-blocker like finasteride prior to treatment. 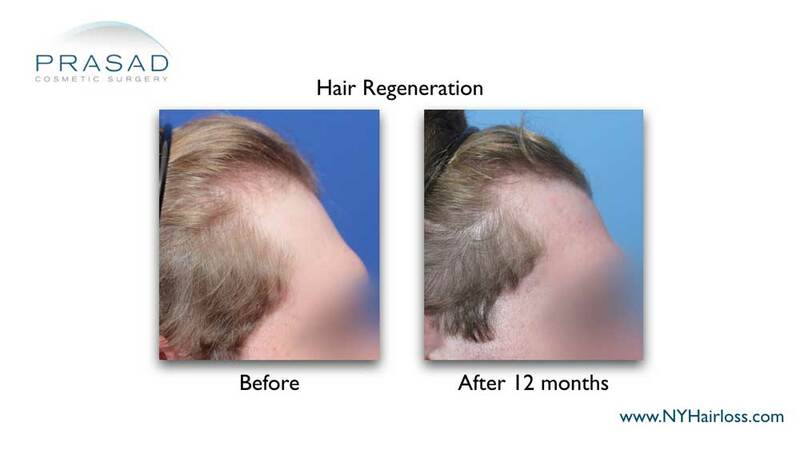 Thinning hair at the mid scalp and crown grew back thicker 10 months after a single TrichoStem™ Hair Regeneration PRP+ACell injection treatment. As DHT-sensitivity is lower for cases of later onset of pattern hair loss, a DHT-blocker like finasteride was not prescribed. His results are from a single Hair Regeneration injection treatment session. Since had an older age of onset, DHT-sensitivity was lower, so taking finasteride after treatment was not as important as a younger patient with high DHT-sensitivity. 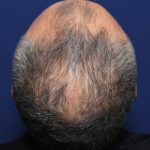 Thicker hair growth from thinning hair, and new hair growth from dormant hair follicles were achieved progressively, with pictures taken 10 months after treatment. Thickening miniaturized hair, as well as stimulating hair growth from dormant hair follicles were seen at the frontal hairline and mid scalp. Darker hair is often a side effect of the Hair Regeneration treatment. For men with high DHT-sensitivity, evident in early onset of pattern hair in the late teens, 20s, and early 30s, a DHT-blocker is often needed to sustain results of the treatment longer. For men with an age of onset in their late 30s and older, DHT-sensitivity is not as acute, so the need for a DHT-blocker like finasteride is decided on a case-to-case basis.